And yet another beading piece! - I see better from a distance. And yet another beading piece! Finished this one a week ago, but didn't get around to posting pictures of it until now. It's, um, a bit unusual. 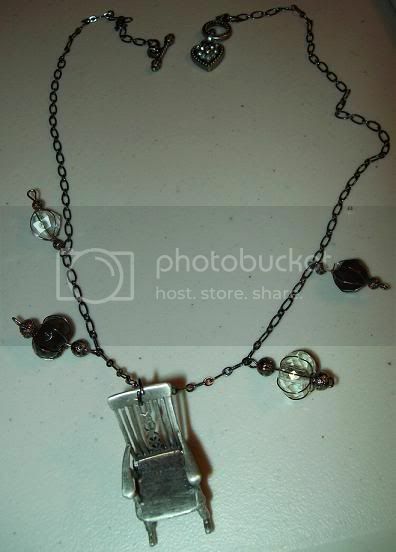 I never thought of a little chair being the focus point of a necklace before...but when I saw it in the store I figured I should get it and do something with it! I won't get home from the game until probably 2 a.m.! It's a long drive to D.C.- I just hope we don't get lost. None of us have been to the new stadium yet. This is going to be a "girl's night out"- me, Mom, and Katie. Not something we've done in a long time...and it doesn't involve shopping for a change! Definitely taking my camera. I think we'll have fun! Katie got good seats. I'm going to look funny wearing a Nationals shirt but cheering for the Mets, though! :p Kind of a win-win for me, though- I don't like to see the Mets lose, but I'd love to see the Nationals win for a change, too. I think the Mets can afford to lose one or two, it's still early in the season.